SAP is the name of the company founded in 1972 under the German name (Systems, Applications, and Products in Data Processing) is the leading ERP (Enterprise Resource Planning) software package. 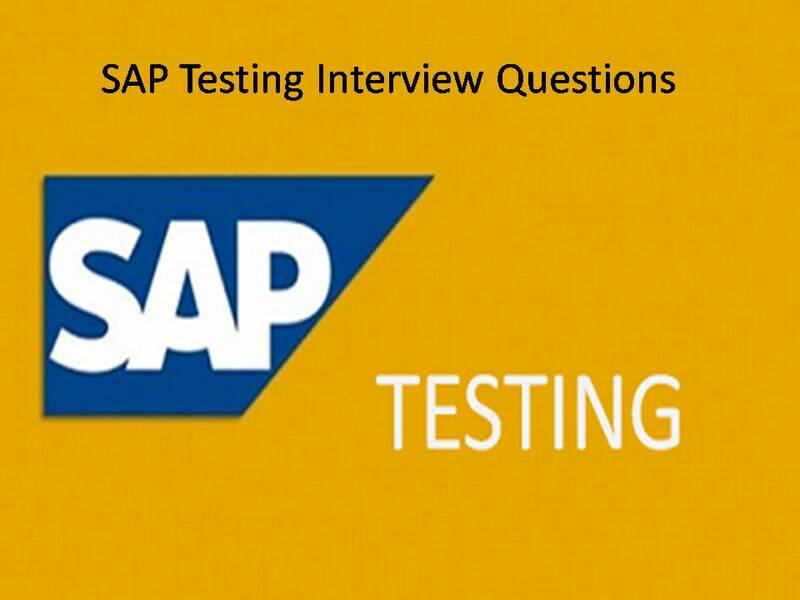 2) What is SAP Testing? SAP testing helps to detect and rectify errors at all project phases.So it gives the high confidence that the SAP application supports business process as per organization requirements from the day of go-live phase. 3) Why do you usually choose to implement SAP? There are number of technical reasons numbers of companies are planning to implement SAP. It’s highly configurable, highly secure data handling, min data redundancy, max data consistency, you can capitalize on economics of sales like purchasing, tight integration-cross function. 5) What are the different types of ERP? SAP, BAAN, JD Edwards, Oracle Financials, Siebel, PeopleSoft. Among all the ERP, most of the companies implemented or trying to implement SAP because of number of advantages over other ERP packages. 6) How can an ERP such as SAP help a business owner learn more about how business operates? In order to use an ERP system, abusiness person must understand the business processes and how they work together from one functional area to the other. This knowledge gives the student a much deeper understanding of how a business operates. Using SAP as a tool to learn about ERP systems will require that the people understand the business processes and how they integrate. 7) Why do you usually choose to implement SAP? 8) How can an ERP such as SAP help a business owner learn more about how business operates? In order to use an ERP system, abusiness person must understand the business processes and how they work together from one functional area to the other. This knowledge gives the student a much deeper understanding of how a business operates. Using SAP as a tool to learn about ERP systems will require that thepeople understand the business processes and how they integrate. 9) What is the different type of users in SAP? 10) Explain what is the use of reference and service user in SAP? Service User: For “service user” initial password or expiration of password are not checked. Only admin has rights to change the password, users cannot. Multiple logins are possible. Reference User: For this kind of users GUI login is not possible. Usage: In case of emergency, with the help of reference user, it is possible to provide one user authorization to another user. 11) Explain what is “Data Sets” in SAP? To solve queries which cannot be solved by using the method interfaces, a set of information is used. This set of information is known as “Data Sets”. SAPS stands for SAP Application Performance Standard, which is a hardware independent unit which describes the performance of a system configuration in SAP environment. 13) How many types of work processes are there in SAP? 14) Is SAP a database? NO. SAP is not a database but it uses databases from other vendors like Oracle. Although SAP has recently released its own database HANA. 15) What is SAP R/3? A third generation set of highly integrated software modules that performs common business function based on multinational leading practice. Takes care of any enterprise however diverse in operation, spread over the world. In R/3 system all the three servers like presentation, application server and database server are located at different system. 16) What are presentation, application and database servers in SAP R/3? The application layer of an R/3 System is made up of the application servers and the message server. Application programs in an R/3 System are run on application servers. The application servers communicate with the presentation components, the database, and also with each other, using the message server. All the data are stored in a centralized server. This server is called database server. 17) What is the difference between Developer Trace, System Log and System Trace? a) System Trace: When you want to record internal SAP system activities, system trace is used. The trace is useful in diagnosis internal problems within SAP system and the host system. b) System Log: To know the recent logs for application server and CI, System log is referred. c) Developer Trace: In the event of problems, developer trace, records the technical information about the error or problem. For problem analysis and system monitoring Developer trace or System log is used. 18) What is OSP$ mean? 19) What is the difference between – support package, kernel and SAP note? • SAP Note: An error in a single transaction or program is removed by implementing a SAP note. • Kernel: Kernel contains the executable files (.EXE) like other applications and when a Kernel upgrade is done a new version of the EXE file replaces the older versions. 20) What is private mode? In private mode, the heap data is exclusively allocated by the user and is no more shared or available across the system. This occurs when your extended memory is exhausted. 21) Explain what is SAP IDES? SAP Internet Demonstration and Evaluation System or SAP IDES, this system demonstrate the functionality of various SAP solutions used by important customers. 22) What is the role of “Application Server”? Application Server takes the request from the user and if the request requires data then it connects to the database server and gives output. 23) What is supplementation language? Default SAP systems are pre-installed with English and German. SAP does support many other language which may not full translate from the default English and German. To fill this gap, Supplementary language (a program) is installed. 24) What are the different types of RFC and explain what Transactional RFC is? Transactional RFC (TRFC): This type of RFC is similar to asynchronous RFC, but by allocating a transaction ID (TID) it makes sure that the request sent multiple times due to an error must process only for once. In T RFC the remote system does not have to be available at the moment unlike asynchronous RFC. 25) Explain how to define logon groups? Logon groups can be defined using the Tcode smlg. In order to do that you have to create the group and then assign the instances for that particular group. 26) What is SAP single stack system? A single stack system is defined by SAP system either with JAVA as runtime engine or SAP Net weaver as ABAP. 27) Explain what is heterogeneous system copy and homogenous system copy? Heterogeneous system copy= Different OS + Different database or same database. 28) What is the difference between OLAP and Data Mining? OLAP – On line Analytical processing is a reporting tool configured to understand your database schema, composition facts and dimensions. By simple point-n-clicking, a user can run any number of canned or user-designed reports without having to know anything of SQL or the schema. Because of that prior configuration, the OLAP engine “builds” and executes the appropriate SQL. Mining is to build the application to specifically look at detailed analyses, often algorithmic; even more often misappropriate called “reporting. 29) Explain what is business KPIs? Business KPIs are Key Performance Indicators. It indicates the performance of a company at a strategic level. They help in leading the company on the desired track by comparing company’s previous performance with the market leaders in the same market. 30) Name some drawbacks of SAP? Interfaces are huge problem, Determine where master data resides, Expensive, very complex, demands highly trained staff, lengthy implementation time.